The Nokia C7 packs plenty of punch. But it might be let down by Symbian^3, which doesn't bowl us over. Pity that, as Nokia is probably stuck with it for a while to come. The Symbian^3 operating system is really important for Nokia. The company has taken a lot of knocks from the iPhone and the many handsets running Android, meaning its market share has suffered. Android phones such as the HTC Wildfire and Orange San Francisco have muscled in on Nokia's vital mid-range territory, and that's been a real pain in the proverbial for Nokia. Google's OS has even snaffled up Sony Ericsson and Samsung's attention, as evidenced by Sony's Xperia X10, X10 Mini, Mini Pro and Samsung's Galaxy S, leaving Nokia to hold the Symbian baby. So can Symbian^3 still come to the rescue? We're not so sure. The Nokia N8, which we recently got to review after a massive six-month wait, puts Symbian^3 into a high-end, flagship handset. We liked the N8 itself, but had some issues with how Symbian^3 worked. That doesn't bode well for the C7, which runs the same OS and so works in pretty much the same way. 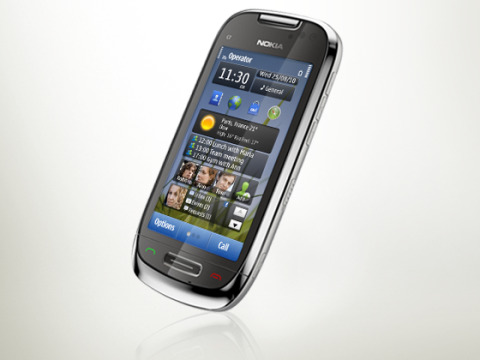 At the time of writing, the N8 had a SIM-free price of £429 and the C7 clocked in at a still pocket-draining £389. What do you get for your hard-earned cash, then? Well, the C7 totes an 8MP camera and has a front camera for video calling. It also has 802.11 b, g and n Wi-Fi; 8GB of built in memory; GPS and, just like the N8, Bluetooth 3.0. This has a greater range and is a whole lot faster than Bluetooth 2.1 as long as you're connecting to another 3.0 device or enabled PC. Communicate with older Bluetooth versions, though, and the Nokia C7 is pulled down to their standard. There's 8GB of internal storage too, and support for a microSD card to add more space. However, we think it's a design issue that you need to remove the battery to get to the microSD card slot – it's terribly inconvenient. Anyone who likes to hot-swap their stills, video or other content is going to find themselves doing a lot of rebooting, which is never acceptable. And to add insult to injury, the SIM (which you hardly ever want to get at) can be removed without touching the battery. The C7 can't compete with the N8 in build quality either. The body is mostly plastic, although there is a metal backplate that echoes the N8. Still, the plentiful plastic does mean a light handset, and the C7 has a heft of just 130g. Despite its plastic frame, the Nokia C7 feels comfy in the hand. It's quite slim and has a fairly narrow profile too. It's easy for smaller hands to reach all the way across it for one-handed use – ideal when you're on the bus and holding on for dear life with the other hand. Our review sample has a black all-round chassis, but you can also chose reddish brown (Nokia calls it Mahogany Brown) and silver (Frosty Metal) alternatives. There's a fair amount of space both above and below the 3.5-inch screen. At the top it looks a bit wasted, although the rare front camera sits here, as does the Nokia branding mark. Beneath the screen lie Call and End buttons, along with a wide, lozenge-shaped menu key. These all light up when you use the handset in entirely expected green, red and white shades. There are plenty of buttons and connectors, mostly huddled on the top and right edges of the chassis. On top, there's a USB port for connecting to a PC, which is protected by a hinged cover. The 3.5mm headset connector is here too, as is the main on/off switch. Meanwhile, the right-hand edge houses a camera shortcut button; a lock switch, so that you can make the handset lock down easily; a pair of buttons that double for volume and zoom controls; and the Voice Key, which sits between them. We'll come back to this a bit later on. All on its lonesome on the left-hand edge of the chassis is a charge connector. The phone will also charge over USB.